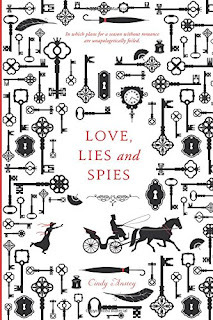 If you long for the Regency romance that was long on banter and a comedy-of-manners and short on the bedroom frolics, if you wish for a modern day Jane Austen with a splash of James Bond, then do I have the book for you. LOVE, LIES, and SPIES is a young adult novel by Cindy Anstey, which I found by happy accident on a shelf at work (I work near a group of literacy professors; they always have young adult novels around), and was immediately sucked into the opening scene in which our intrepid heroine, Julianna Telford, scientific researcher of lady insects and soon to be published author (if she gets her way), is hanging most disastrously off the side of a cliff. To which she says, “Oh my, this is embarrassing.” I think we can agree that’s a gross understatement. And when she hears voices overhead, does she scream for help or thank the heavens for such speedy rescue? No. She asks—when they approach—if they are gentlemen. When they answer in the affirmative, she declines their offer of help and asks instead for their assistance in securing appropriate help, like a farmer, because if she’s found in the company of a strange gentleman, she’ll be sent home in shame. No publishing. The horrors. Spencer Northam (don’t you love the name?) is looking for a spy. 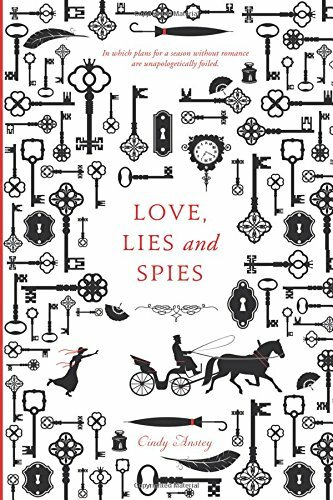 What he’s not looking for is a woman who seems to be in the thick of every sort of trouble, keeps secrets, and associates with questionable people; however, he can’t seem to help himself and he can’t seem to help hoping Julianna is not the spy he’s looking for. Capers and hilarity ensue; and there’s a kidnapping…but in the end, Spencer gets his spy and Julianna gets her man. The writing is classic, packed with banter, complete with many lines that felt like the author was someone who loved and studied Austen’s way with phrasing—and maybe even a few of her more deplorable (and most love-to-hate) characters. I definitely want to find what else this author is writing. I don't usually read young adult books but this one sounds like it will be a hoot. Hellie, I meant to respond to you about this one on Facebook. It sounds delightful. Will have to check it out! Reminds me of a Tony Hancock comedy where Bill Kerr is eating peas with custard. After comment he says "there's nothing here that I don't like"